The Ballard team recently sat down with our after-sales expert Silvano Pozzi, to discuss some of the realities of fuel cell bus maintenance and operation in the world today. Our goal with this interview is to give you insight into what transit authorities can expect when they decide to deploy a fleet of hydrogen fuel cell buses in their own communities. Silvano Pozzi is a mechanical engineer with a Masters Degree in automotive engineering. He has been working with Ballard for the past 20 years, and currently leads the after-sales organization. Prior to Ballard, Silvano Pozzi was a Product Development Manager with Mercedes-Benz. 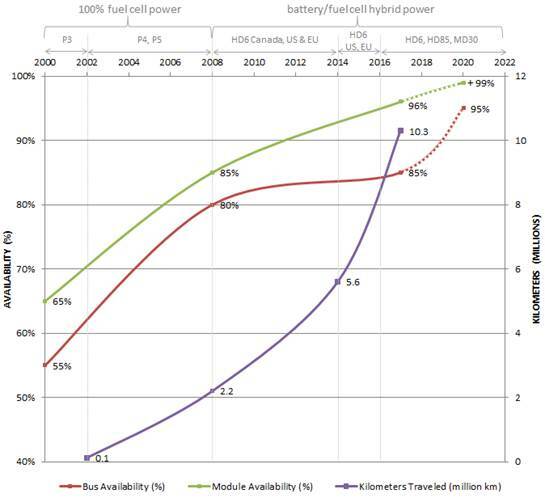 How does Ballard help transit operators maintain up-time for the fuel cell buses? Our service model is quite simple. It comes down to a combination of transferring knowledge to customers, making sure knowledgeable technicians are present, and that the parts and documentation are always available. Our goal is to ensure our customers and their technicians are all comfortable with the technology, and are capable of performing fuel cell bus maintenance on their own. We provide training programs and support for this. In addition, the best way to maintain hydrogen fuel cell buses on the road is to be there fast. Our site technicians are situated closely to where the buses operate so they can respond quickly and in the best way to issues that arise. We make sure to always have parts available so we can deliver them as quickly as possible. How is Ballard’s International Service Team structured? The entire team is now about 30 people around the world, strategically located to provide comprehensive service in a timely manner. The team located at Ballard headquarters in Vancouver, Canada supports all of the satellite locations. We provide additional resources and people that can be deployed around the world if needed. Ballard has a four person team in China to support the fuel cell bus fleets being deployed there. We are in the process of putting in a service centre, and increasing service presence in different provinces as needed. We are also making large effort in providing local training to technicians there. In the US, we have strategically located our technicians on the west and east coasts, to best support the US operators of Ballard-powered fuel cell buses. The European team most closely matches the capabilities of the Burnaby team. There are a total of five technicians, a certified service provider in Germany, central and local parts inventories, and a repair center. We are also in the process of building up a European training facility. How does having a local service team in Denmark help Ballard support buses in the EU? It helps tremendously. The service team is well located, and this makes it very easy to move things in an out. They can fly or even drive to many locations within Europe. Also, Denmark has extremely high-quality labour - the team there has excellent training and strong technical background. So the team has a mix of great attitude, great capability, and strong skill sets that we can build on. They respond fast, with quality and accuracy. How has Ballard’s ability to improve bus key performance metrics increased over time? The first reason is that we monitor a very large fleet of fuel cell electric buses, globally speaking. Having a fleet of this size travelling every day in different climates, on varied routes, and with different load profiles brings in important, good quality data to Ballard. The key here is this data is not just from a few buses. With 70 buses in operation, Ballard supports the largest fleet of hydrogen fuel cell buses in the world today. The second reason is that our methodology of data collection is somewhat mastered now. This allows us to make excellent use of all the data that Ballard gathers, and guides how we communicate it, both internally and in sharing it with the customers. For example, we first review and interpret the data to determine what is most relevant and important. Safety is the highest priority. We then share the results and action plans with the customers. This also helps us to focus our resources on the main priorities as well as to the search of the root cause of the issues that need resolving. Internally, this methodology helps us create solutions more quickly and accurately, and then pass down that information to technicians on the field and to engineers for consideration as we design next generation products. Over time, this helps improve the performance of the buses, designs and technologies. As a result, we find we have continuously less fuel cell bus maintenance issues to deal with and better fleet performance. 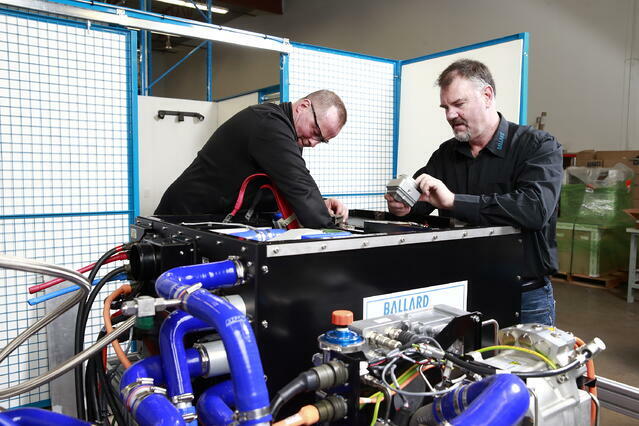 Data gained over the past 17 years provides powerful insights to Ballard’s technical team, resulting in 96% availability for the fuel cell module. What are some major differences a bus technician may notice in servicing fuel cell buses vs diesel buses? The first major difference is how clean it is to work with one of the fuel cell buses. What’s behind that is, the fuel cell buses operate at much lower temperatures. In addition, all of the dust that diesel engines collect on the road isn’t really found on fuel cell engines, as they are more enclosed. There is also no combustion, which results in a much cleaner operation. Fuel cell engines need a way lower amount of grease and lubricants because there are fewer moving parts. Another big difference is the technology itself. Fuel cell engines are heavier on the control and software side, so technicians need a different skill set to work with hydrogen bus technology. Also, fuel cell engines have a high voltage and high pressure gases. Ballard fuel cell electric bus technician performing maintenance on a New Flyer Bus. This is often a new challenge for many technicians, but most of them enjoy it, because it gives them an opportunity to learn new things. Overall, technicians report that the fuel cell bus maintenance procedures are much simpler than they originally expected. 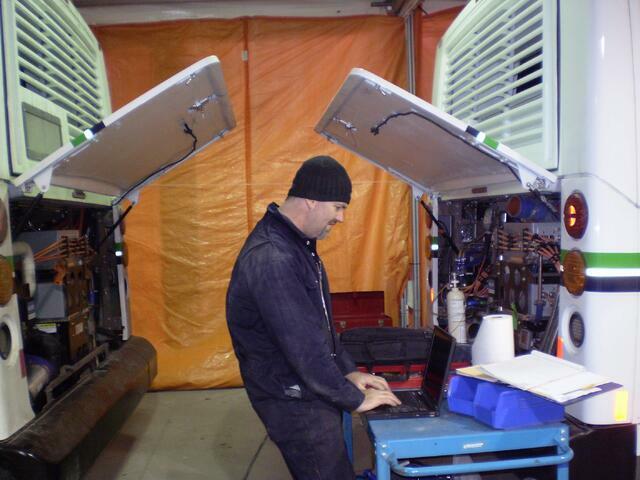 We find it doesn’t take long for these technicians to become fuel cell advocates! There are also some notable hardware differences, and technicians will need to take some time to recognize the parts. Fuel cell engines also have fewer moving parts, and the engine itself is quieter - you often don’t even hear it. Everything else is similar to an electric bus, for example, most of the coach systems are identical. Any transit authority or municipality who deploys Ballard’s fuel cell powered buses in their fleet will benefit from a support team committed to excellence and success. We are passionate about empowering our customers with knowledge and providing the tools they need to become fuel cell powertrain experts in their own communities. In addition, fuel cell mechanical training results in sustainable and localized employment opportunities in the areas we operate. Local economies grow, and citizens reap the benefits of cleaner air and improved quality of life. 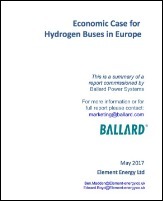 Learn how fuel cell electric buses will benefit regional economies in Europe in our free white paper below. How can fuel cell buses benefit your local community and economy?